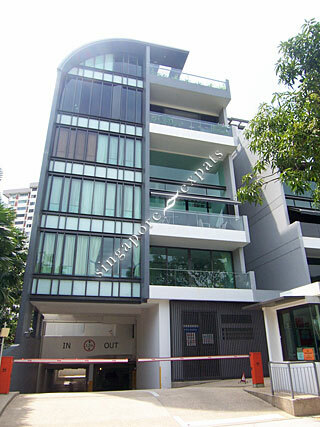 DUKES RESIDENCES is located at 27 DUKE'S ROAD in district 10 (Bukit Timah, Grange, Holland) of Singapore. DUKES RESIDENCES is a Freehold Condo development consisting of 42 units. DUKES RESIDENCES is completed / TOP in 2012 (estimated), developed by MANSTON LAND PTE LTD.
Educational institutions like HWA CHONG INTERNATIONAL SCHOOL, CHINESE INTERNATIONAL SCHOOL, MELBOURNE SPECIALIST INTERNATIONAL SCHOOL, NANYANG PRIMARY SCHOOL, RAFFLES GIRLS' PRIMARY SCHOOL and SINGAPORE CHINESE GIRLS' PRIMARY SCHOOL are near to DUKES RESIDENCES. DUKES RESIDENCES is accessible via nearby BOTANIC GARDENS, TAN KAH KEE and FARRER ROAD MRT Stations. Highly accessible yet tucked away in a tranquil neighborhood. A transquil development surrounding by landed property in prime district yet so close to everything you need and near town.